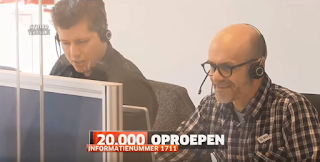 (UPDATE: APOLOGY GIVEN) BELGIAN CRISIS CENTER TELLS ISRAELI BOMB VICTIMS THEIR COUNTRY DOESN’T EXIST…… – The Tundra Tabloids……. The crisis center operator was named Zakaria, I would guess, an Israel hating muslim. As Europe becomes more islamized, we can expect this kind of behaviour becoming the norm. It’s why many Jews throughout Europe are against the importation of Muslims, and why Israel is worried about the eventual slipping of Europe from the realm of free states. At least two Israelis were injured in the terror attacks in Brussels. Israel would like to fly them home and so in order to release them from the hospital, a Jewish volunteer called up the Crisis Center set up by the Ministry for Internal Affairs to ask about the procedure. He was told that the Israeli victims could not be sent back to Israel, they can only be sent back to Palestine. The family of the victim is shocked and says that “It’s just like Iran here”. NOTE: This is something that the promoters of the anti-Israel meme of the Jews / Zionists controlling muslim immigration vis-a-vis multiculturalism, for whatever their reasons, fail to take into consideration. This (the Islamization of Europe) all works against Jewish communities throughout the West, as well as against future Israel social and economic relations. IPG profoundly regrets that an employee, when answering a call to the crisis centre of the Ministry of Internal Affairs, systematically used “Palestine” to indicate the country of Israel, and by doing so sought confrontation with a Jewish volunteer. IPG would like to take this opportunity to express our deepest sympathy to all the victims of the tragic events of last week in Brussels, as well as their relatives. NOTE II: What about disciplinary action against the operator? Next Post Next Post UN CLIMATE OFFICIAL EDENHOFER ADMITS REAL MOTIVE OF CLIMATE SCIENCE SCARE IS REDISTRIBUTION OF WEALTH…….